Model size: 16.5" x 15.25"
Chart: Hand drawn originally. Later, computer generated. Description: This is an unusual sampler featuring an over one alphabet incorporated into the outer border. 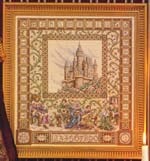 Against a tapestry-look background, a framed panel contains a mountain-top castle and wind-swept clouds. The lord and lady of the castle hold court beneath the castle scene, enjoying music being played by a group of minstrels. Stitching Comments: A fairly difficult piece, due to its size, blended threads, quarter stitches, and the incorporation over-one elements which are charted separately.